The U.S. Navy's new aircraft carrier is the most advanced in the world, carrying more aircraft and weapons than ever before, Allison Barrie reported recently through Fox News. The defense specialist said that The USS Gerald R. Ford is $13 billion futuristic ship complete with a gigantic flight deck and a new electromagnetic system to launch aircraft. The state-of-the-art tech and operational systems mean aircraft will be able to take off faster to get to the fight quicker. At 1,100 feet, the new Ford carrier is about the size of three football fields. Built by Huntington Ingalls Industries, the Gerald R. Ford (CVN 78) is the first new aircraft carrier design since USS Nimitz (CVN 68) – that’s the first new design in about 40 years. The Navy has ordered three of these Ford-class carriers -combined price tag approximately $42 billion – and this is the first. On Saturday, July 22, the Navy will commission the Gerald R. Ford with fitting pomp and circumstance at the Naval Station Norfolk. So what advances does this new carrier offer? For starters, the ship is so advanced folks describe it as being able to sail itself. 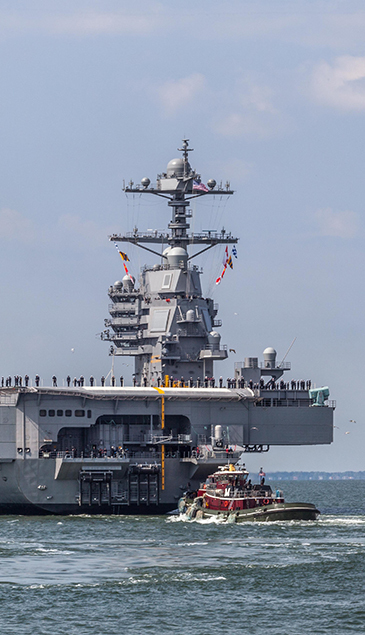 The traditional throttle system used to power and steer the U.S. Navy's older carrier classes has been replaced by a thoroughly modern touchscreen navigation display. The Ford class is designed with the sailor in mind. The design incorporates features to improve quality of life for sailors and to make maintenance easier. There was also a lot of consideration put into how to improve survivability against a wide range of current and anticipated future threats – and that helps keeps sailors safer. In fact, the advances with this latest aircraft carrier mean things are more automated. The Ford has a crew of 2,600 sailors, so that means 600 less Ssilors are needed than on Nimitz-class class vessels. With two new reactors, the Ford class has about 250 percent more electrical capacity than previous carriers. The ship will be able to load weapons and launch aircraft faster than ever. The aircraft carrier has state-of-the-art electromagnetic catapults and advanced arresting gear. The larger flight deck will also make it easier for the aircraft to maneuver. The captain sits in a tower and on this carrier the “island’s” position has changed, giving the captain better visibility. Designed by General Atomics, the Electromagnetic Aircraft Launch System (EMALS) is designed to replace the steam system used on other carriers. It will provide improved launch operational ability for manned aircraft and drones. In addition to launching more aircraft, this system aims to provide other advantages, like reducing thermal signature – which is something enemy radars look for. So far the system has successfully launched sleds that simulate the weight of an aircraft. Live sea trials with aircraft will not start until the weeks after the commissioning. When aircraft land on the carrier, the new electric motor-based Advanced Arresting Gear (AAG) system helps provide deceleration. There have been some teething problems reported with this new system, but the idea is that it uses energy-absorbing water turbines with a large induction motor to control the arresting forces to stop the aircraft. The Ford class features other features like a new advanced reactor plant, propulsion system, electric plant, machinery control, Dual Band Radar and integrated warfare systems. In fact, these carriers will have more than 20 new or modified systems compared to the prior Nimitz class vessels. Why is a carrier important? U.S. aircraft carriers are a pivotal part of the fleet. In fact, they have such powerful reputations that their mere presence can be enough to discourage enemies from taking any action. Oceans cover more than 70 percent of the planet and aircraft carriers can travel the world’s oceans to provide U.S. military with access nearly anywhere. Such a futuristic aircraft carrier, the most advanced in the world, will play a role in staying ahead of adversaries. After the commissioning, the Ford will undergo more testing and then the first deployment will be in 2020.The next two Ford class ships will be the future USS John F. Kennedy (CVN 79), and the future USS Enterprise (CVN 80).